I am using Amarena cherry several years now. I thought they are the best compromise (even if they are a compromise at all) between taste, looks, quality. If only they were Amarena cherries with stem (they've got lower points in the style, due to this reason). Amarena cherries are beautiful almost black cherries in very sweet syrup, they still have a snap and they are quite natural [this is a bit confusing - because obviously they are heavily processed, they are cooked in a lot of sugar and half inverted - with quite natural I mean, that the producer don't help themselves with the box of food-additive wizary - all ingredients are "really" natural]. This is pretty much the opposite of the typical bright red Maraschino cherry, which is bleached, stabilized, dyed and flavored with artificial colors and flavors. 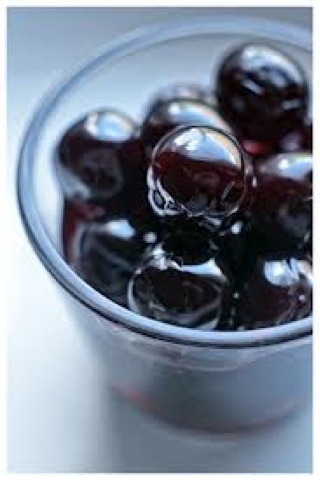 It was not long after I've started to use this amazing product, that I wondered, how to use the dark sweet syrup, which is full of the Amarena flavor - deep cherry flavors with the typical almond note, which comes, when you are stewing drupes with some of the stones of the fruit. You have to see: oppose to Maraschino cherries, Amarena cherries are quite costly. Quality has its price! I used the syrup then in cocktails. American whiskey just pairs fantastically with this aromatics, gin also works (think sloe gin, the sloe is also a drupe), brandy and rum are not directly connected, though also work well (don't mention now vodka- just don't). And if you combine coke, Amarena syrup and ice, you will have a stellar cherry coke! Today I took latter a bit further... I made Amarena soda. Pragmatically you can say, that cream soda is a flavored soda which contains vanilla aroma... I thought this would be a good point to start. And off course the Amarena cherry syrup also mustn't be missed in the mixture. As we are doing a soda, which has always sweet-sour characteristics, we would need some sourness,which doesn't distract from our flavors here. Citric acid is a good ingredient here- it is almost everywhere available. An even better fit would be acid phosphate, which is even more neutral (citric acid's origin: citrus, remain in its character - acid phosphate has a much cleaner tasting acidity, though is not everywhere available). Please read more about it on Darcy's blog - www.artofdrink.com. I also added a bit more sugar, as I didn't wanted that it is too concentrated. The secret behind a soda is a rather light base flavor which is elevated by sweetness, sourness and fizz. And plain ol' water is also necessary. A lot. Cream sodas are though very sweet and lacking often a bit the edge. So I thought, why not adding a bit liquid smoke? I bought (at Carrefour, if you'd like to know), three small bottles of Colgin liquid smoke. This is all natural only containing, water, vinegar, molasses and smoke (duh) and they are coming in pecan, mesquite and hickory [they didn't had Apple, as on the picture]. I used pecan, as it was already open and it's sweeter smoke flavor would compliment better the overall character. All into the Soda plus (I am a fan now), with some added ice, flashed with one CO2 bulb, charged with another. Today I've learned again- one cartridge is not enough to properly carbonate the Soda plus bottle... I have to see, if I could save one cartridge if I skip the flashing, or if I really have to use three cartridges. Anyway out comes an adult soda, which is very complex and would go well, with the mentioned distillates - or just on its own. Adult, because I guess, that the funky smokiness wouldn't be exactly the taste of kids.